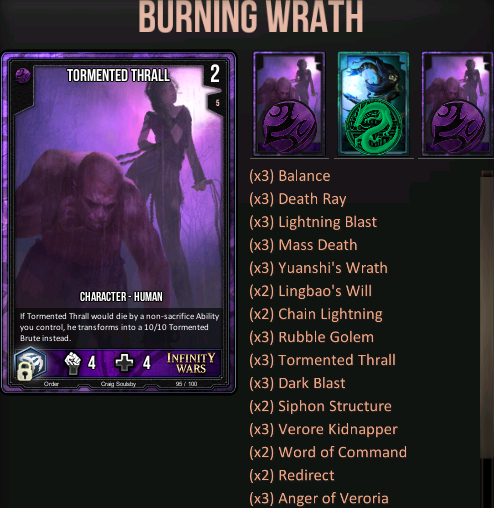 Here are few decent decks that can be build without highest rarity cards (with exception for Evellee). 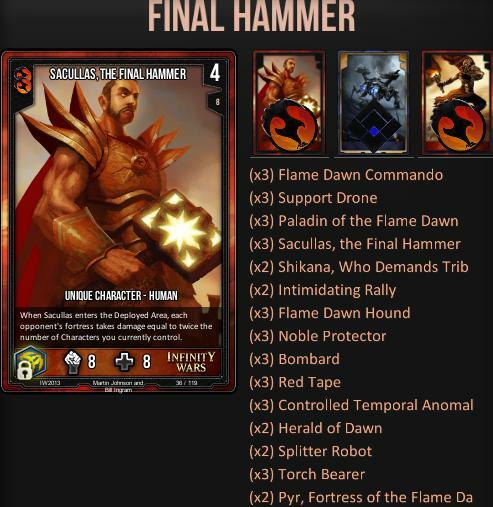 FINAL HAMMER combines direct and inderict damage + maximize the latest. 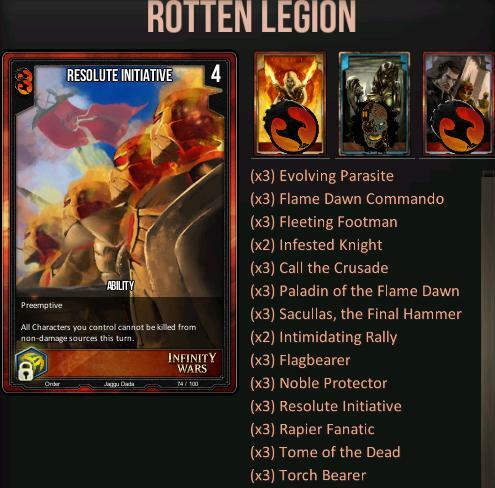 It plays mostly like other rush decks, but Sacullas with Controlled Temporal Anomaly provides you more options to close the game, for this you may let your splitters die for more tokens on board. Herald of Dawn into Shikana for heavy damage. 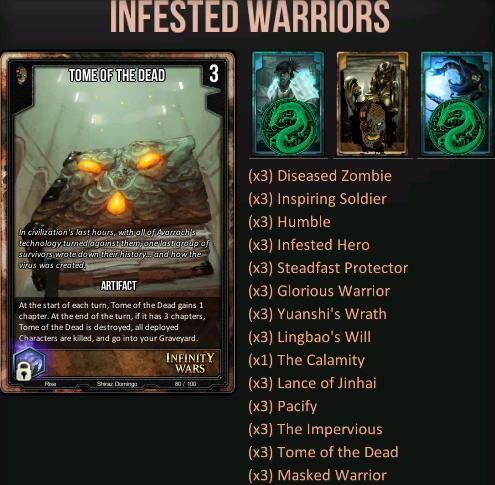 INFESTED WARRIORS main win-condition is morale damage, play Lingbao's Will on turn you expect biggest morale loss and combine it with Tome artifact, which also will stall game. 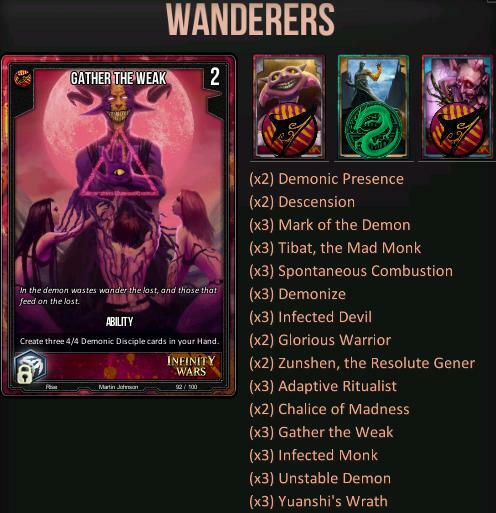 Ability of sage commander together with Yuanshi's Wrath card may wipe out entire board at one go. 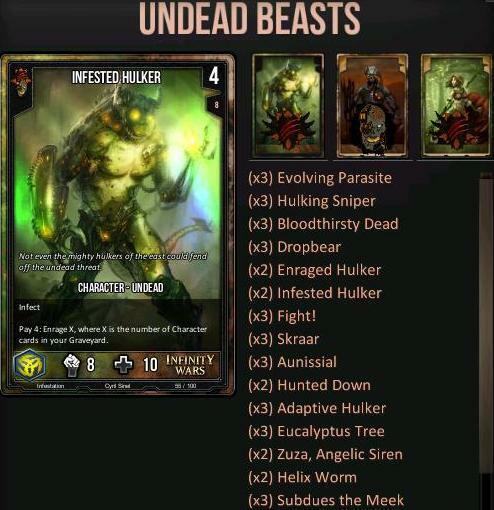 UNDEAD BEASTS can slow down faster decks with Bloodthirsty Dead and Aleta, Fight on Infested Hulker will steal killed char. Aunissial let you play characters like Evolving Parasite with haste or let you use Zuza's ability on the same turn as you deploy her, in late game Helix Worm. If you save dropbears from Eucalyptus Tree, you can spend resources without playing cards from hand, giving you option to overcharge more cards for Subdues The Meek - time it right to claim victory. 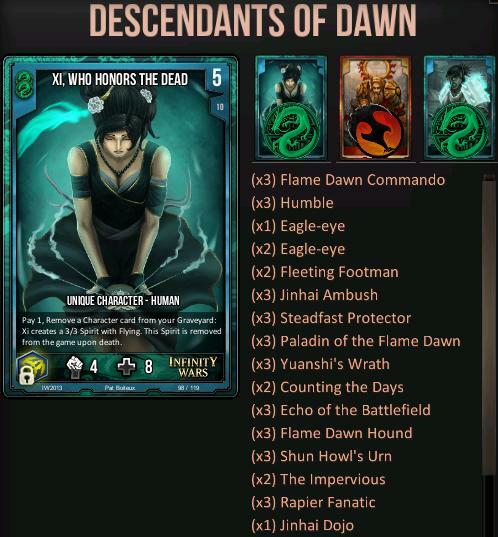 DESCDENDANTS OF DAWN way of play is to deal as much damage as possible early game, then deploy Urn artifact and focus on defence if needed. If you deployed Counting The Days, play Jinhai Ambush and use Xi ability as much as possible in turn that mission will be resolved. 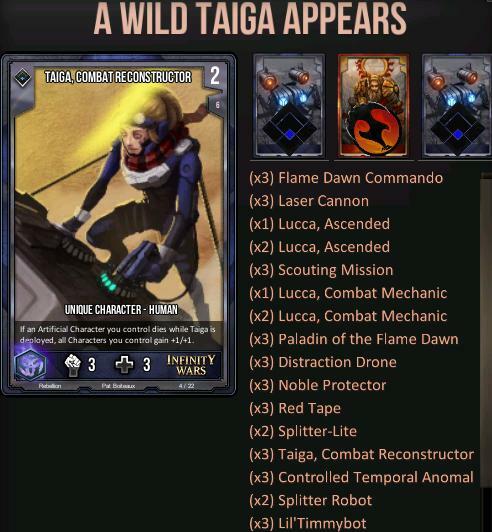 MECHA MADNESS let you deploy important chars like Taiga and Lucca with more reliable way, using her first ability on token from Splitter-Lite gives you high chance to recruit Lucca or big splitter, also the way Recruiter works - let you have multiple unique chars on board. Genetic Splicing together with Zom-B-Gone is a 4 cost combo removal that can kill up to 3 chars. Cannon Fodder for turn 1 play, you can either block with it if needed or wait in suport till buffed. Not much to say about that one, the name says it all. Goal is to kill, kill chars, kill fun, kill everything. It works best against rush and token based decks. If you're type who enjoys seeing little kittens cry, then by all means - this is a deck for you. Rita with Aleta provide fresh supply of tokens every turn, while you have many tools to buff their attack and deal with defenders. 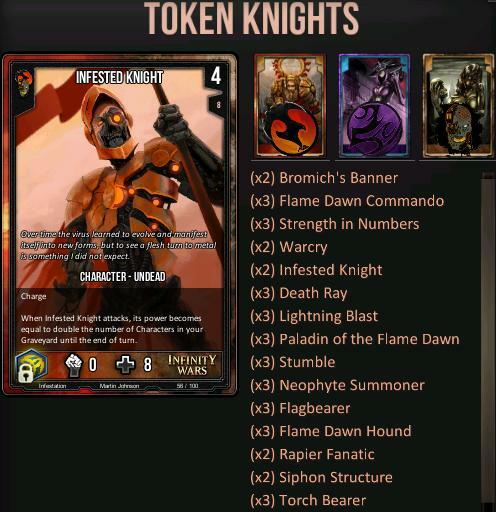 Another token deck, more defensive in early turns, but with many ways of buffing your army. 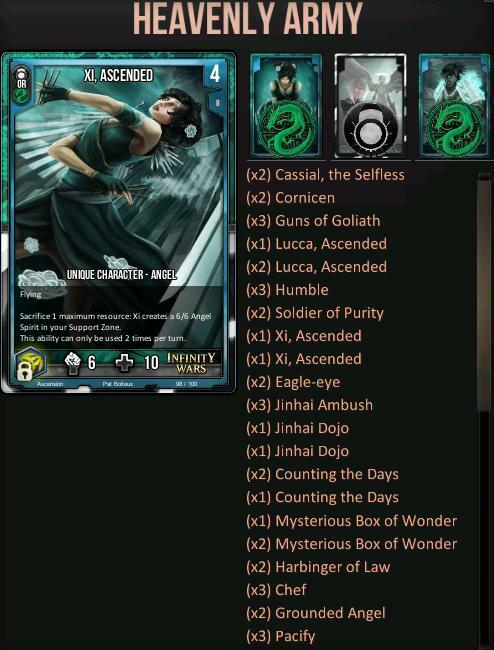 In late game both Xi commander and Xi Ascended gives you unlimited flying angel tokens, while Lucca + Box and Gunz are constant immediate buffs. 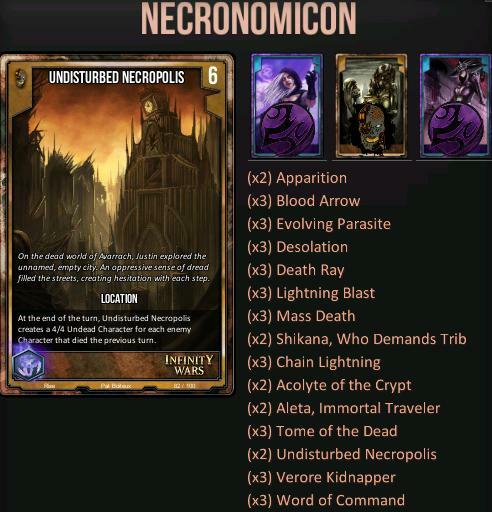 NECRONOMICON is yet another control deck, general plan is to take control on board using huge variety of spells and slowly chop health of enemy fortress with tokens. 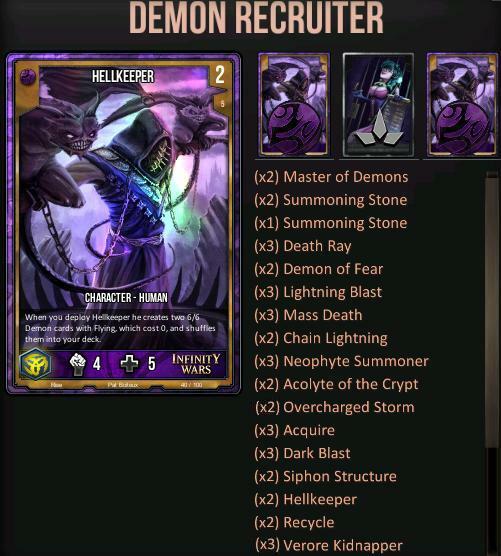 Necropolis location deployed early will let grow your token swarm really fast, making each death double worth, while other player may be intimidated by cost of every mistake. Blood Arrows are cheap and strong removals, and additional cost of sacrificing your own guy is nothing with those commanders. Word of Command is another flexible tool, play surprising parasite or Shikana for example. Factionless Aleta is further source of chars, depending of situation and deck you face, she allows you to make 8/9 beast beast every turn or Verore Death Worshipper, you can copy her with Apparition, or copy Shikana, or troublesome enemy chars like avatars and kidnap them later. 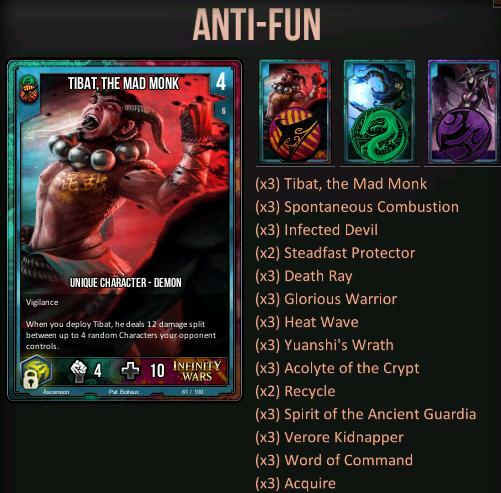 Flying rush, spam with cheap charge chars and buff them with Guns of Goliath and / or Lucca + box (eventually Red Tape). 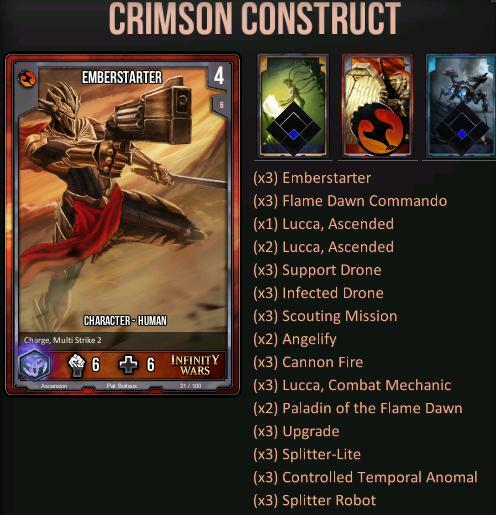 Strong finisher in the form of Emberstarter + Higher Calling or just spam with Xi tokens to finish early. Mix of AOE damage and durable chars - together with commanders, there are 8 that transform into zombie upon death, all just 3 cost. Turn 2 you can use Mark Of The Demon on Ixxi or kill/weaken enemy char. Adaptive Ritualists will let you play best tool available, like playing multiple Gather The Weak at the beginninig or just spamming with AOE spells. Deploy chalice artiifact if you can control the board. Demonic Presence is great against combo decks and COV overall, good idea is to play Gather The Weak before it for 1 cost 6/6 demons next turn. Rush, a little slower but more durable - with Aleta Sufferer you don't care about single deaths, Noble Protectors provide defence against damage abilities, while Resolute Initiative can protect your army from killing spells like Death Ray and Mass Death and your own Tome artifact as well. 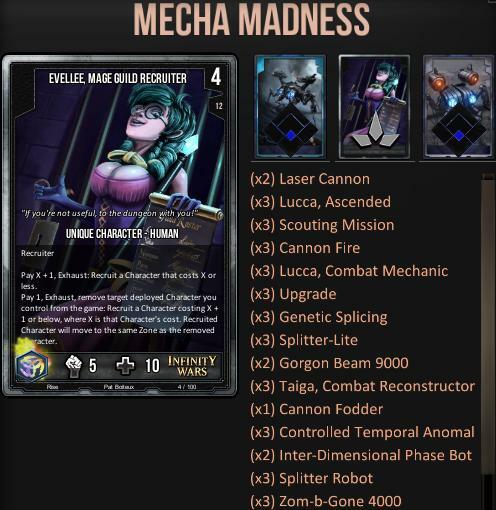 All of this should left you enough chars for Sacullas to do significant damage. Ramp with swarm of beasts, increase reources and keep creating tokens till you can smash opponent with help of Pack Leaders. Try to keep your beasts alive, so up to then don't be afraid of not blocking and taking damage at the beginning of match. 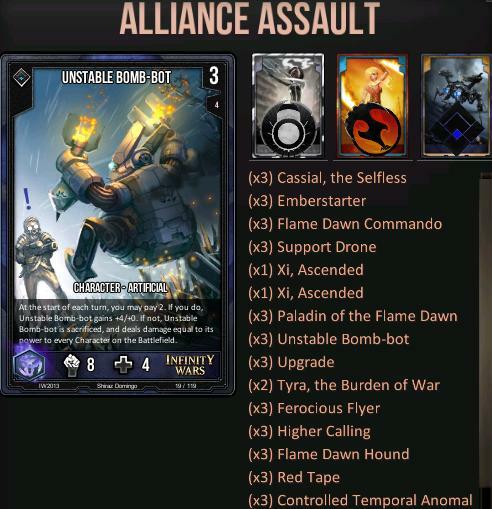 ALLIANCE ASSAULT combines great tools from all factions, combos like Unstable Bomb-Bot with Cassial, which works both as offensive & defensive tool, Emberstarter with Higher Calling and buffs from Genesis. 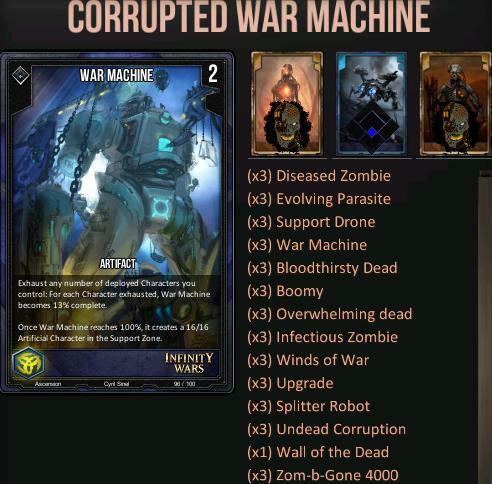 Use War Machine to create big bots, defend with buffed Infectious Zombie and Bloodthirsty Dead, stall with Boomy and Winds of War, kill with Undead Corruption & Zom-B-Gone combo. 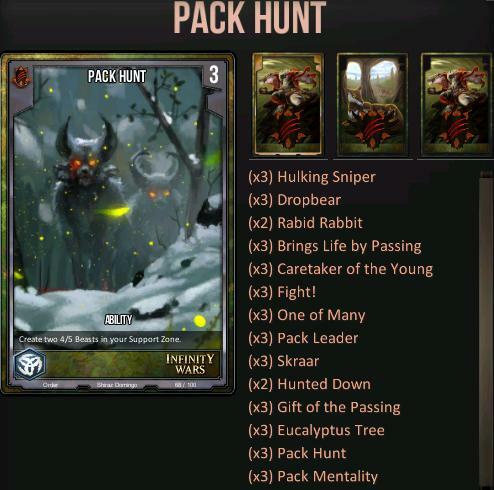 Classic IW deck and really cheap to build. Loaded with burn spells and Rubble Golems that you can balance later, deploy Tormented Thralls and use ability on them to change those into 10/10 chars. Lingbao's Will is basically auto-win against sleepers and other decks with many small chars. Secluded Constructor in command let you use artificals immediately after deploy and Noble Protector is here to let it survives long enough in most games. 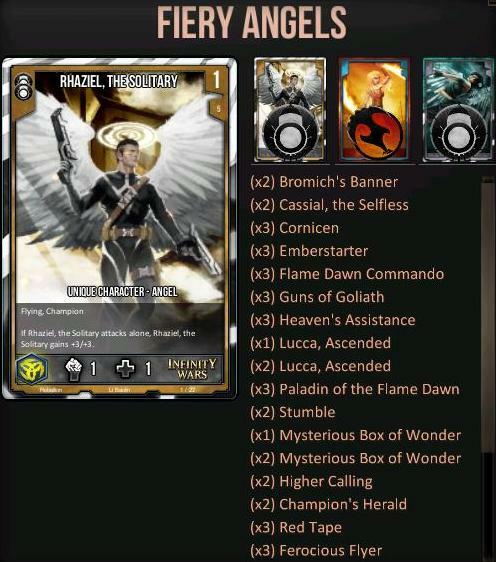 Typical strategy for GI to deploy robots and Scouting Mission and buff them to crazy numbers, with Emberstarter as possible finisher - Angelify will make him untouchable, use it on your priority to not risk some kind of removal. 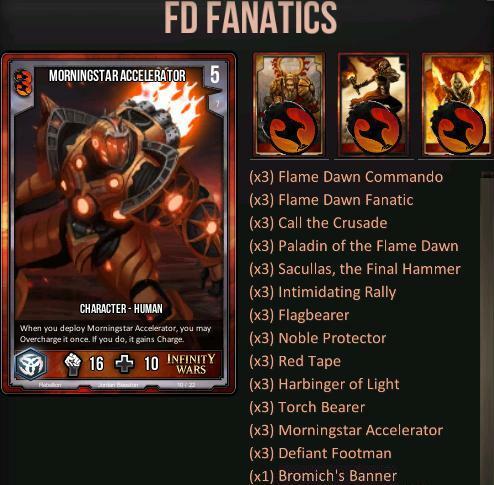 Overcharging Morningstar Acellerator or Int Rally with Defiant Footman while you have (at least) decent board presence gives great value. Playing this deck will decrease queue times, increase EXP and IP gain, add +2 to originality and +10 to cool factor. Awesome decks NTL, i'm sure these decks will greatly benefit new players! Made the topic sticky so it will be easy to spot. really good work. i tried both token knights and heavenly army and they are really well balanced decks. also theyre really cheap to build but still have interesting strategies and combos. thumbs up! Any way to submit deck ideas. I've got tons of reasonably effective decks with very basic cards.